Zuyd America/ / L'Amerique Meridionale. 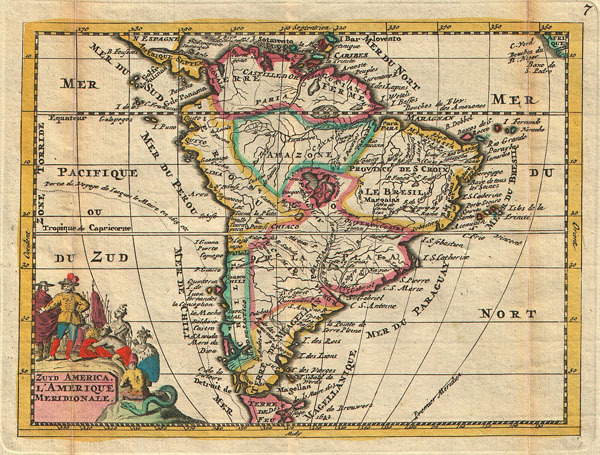 A stunning map of South America first drawn by Daniel de la Feuille in 1706. Continent is represented according to the 18th century political geography. Labels several important cities including Cusco, Quito, Lima, San Sebastian, and Cartagena. Shows two large imaginary lakes in the interior. Title cartouche in the lower left hand quadrant features stylized images of Native Americans offering gifts to Europeans while an enormous and eerily grinning serpent looks on. Title in both Dutch and French. This is Paul de la Feuille's 1747 reissue of his father Daniel's 1706 map. Prepared for issue as plate no. 7 in J. Ratelband's 1747 Geographisch-Toneel.